technique for getting maximum results from this exercise!Take the knowledge and Apply the principles as though your life depended on it, take massive action , produce massive results. Male or female, training the upper chest is extremely important for overall balance in the upper body. Critical, in fact! 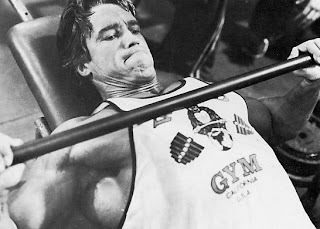 And the Incline Barbell Bench is one of the primary exercises for working the upper chest. But if you're like me, you may have a hard time getting results from this exercise...maybe all you get are tired triceps and sore shoulders, in fact! If so, I've got the solution for you. It's a very simple adjustment to the setup that you use for the incline barbell press and a simple adjustment in how you perform the exercise. One of the biggest problems I've encountered with this exercise, in myself at least, is the tendency for the chest and rib cage to flatten out during the exercise, which takes the tension off the pecs and puts it on the shoulders and triceps instead. In order for the pecs to get a good contraction, the shoulder blades need to be tight in together behind your back with the shoulders back and chest/rib cage expanded. With each rep of the "normal" incline barbell bench press, when you're at the top of the movement (especially when you unrack the bar), the full extension of your arms very quickly causes your shoulder blades to come forward and your rib cage to flatten out, taking the emphasis off the pecs and putting it on the shoulders (at the bottom) and triceps (at the top). So basically, just by unracking the bar, you're immediately putting your body in a poor biomechanical position to perform the exercise with emphasis on the upper chest. Granted, in a lot of people, they will still get a decent amount of stimulation on the upper pecs, even in this situation...these are the people with more favorable anatomical levers, i.e. they'll feel it in the chest no matter how they're arms and shoulder blades line up. 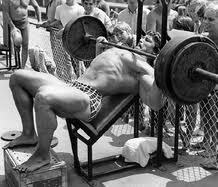 But for many (me included), performing the incline barbell press in this position simply doesn't work. It's not hard to do! Instead of performing the incline barbell press in the bench designed for it, we'll set up in the power rack using an adjustable incline bench. Set the bench to about 30 to 45 degrees - you can experiment with what incline feels best to you - and set it inside the rack. Now here's the part that's going to take some trial and error...set the side safety rails of the rack to where you think the BOTTOM position of the incline press will be on you. The first time you do the exercise, set the empty bar on the rack, just over top of the bench face then slide yourself underneath the bar to gauge the position. Because the REAL key with this exercise (for those of us with unfavorable biomechanics) is to start from the BOTTOM and do SINGLE reps, resetting your body position each and every time you are about to press the bar up. When I started doing incline presses with this technique, I was VERY surprised at how much better it felt and how it actually WORKED the upper chest. I had pretty much given up on the exercise as completely useless for me for quite a few years! So back to our setup...with just the empty bar on the rails (and it should be a bit forward of where you're laying on the bench...you can roll it back into position), grip the bar with a slightly narrower grip than you'd use for flat barbell bench. The bar should be just slightly above your chest while resting on the rails at this point. We want a good range of motion but we also are going to be setting the bar down on the rails after each rep in order to reset the shoulder blades and rib cage, so we still want the bar to finish ABOVE the chest. If the rail height isn't quite right, adjust as needed then check again with just the bar. Once you've got the height right, load up the bar with a moderate weight...something you know you can do...then get back under the bar again.The bar should be a bit forward again when you lay on the bench...roll it back into position just over your upper chest. Now here's the next trick...grip the bar and pull your torso just slightly UP off the bench like you're doing a pull-up row. When your torso is up off the bench, pinch your shoulder blades together behind your back (just like with a row! ), puff and expand your rib cage up to meet the bar, then set your torso back down on the bench. Notice how your shoulders are back, and your chest feels thicker? THIS is the correct position to perform the incline bench press...it's also the position that you LOSE almost as soon as you pass the halfway point of the incline press! Now, with a powerful movement (and striving to keep your shoulders down and back), press the bar off the rails and all the way up in a straight vertical line - there is no backwards arc in the incline bench like there is in the flat bench. It should be straight up and down. Press it all the way up. You'll notice how as you come to the top, you've probably lost that shoulder position and expanded rib cage. No worries! Lower the bar slowly back down and set it on the safety rails. Now, RESET your torso, doing exactly what you did on the first rep! Pull your torso up off the bench, get your shoulder blades back, expand your rib cage then set yourself back down on the bench. Do your second rep the same as you did your first...power it up off the rails straight up then lower under control back down to the safety rails. As for rep range, I find this technique lends itself better to lower reps...5 to 7 reps per set...because of the time it takes to reset yourself between each rep.
At the end of the set, when the bar is back down on the rails, just roll it forward on the rails so you have enough room to slide yourself out from under the bar. This technique is a very effective one for ANY trainer, but especially if you're not particularly biomechanically suited to the exercise. In order to really feel it where you're supposed to, you MUST reset yourself into the best position for your body to perform the exercise...the position that is immediately broken with a conventional unracking of the bar at the top. 1. Set your body into the best biomechanical position to perform the exercise on each and every rep, ensuring you're working the actual target muscles. 2. Gives you short breaks in between each rep, which helps you stay stronger during set, which will allow you to perform more reps with a given weight. 3. Allows you to perform the exercise by yourself, with no spotter, in complete safety. 4. Builds excellent pressing strength out of the bottom because each rep starts from the bottom off a dead stop, with no elastic tension in the muscles. Give this version a try next time you work chest! You'll notice an immediate difference in strength and tension in the pecs. These are fantastic resources to help you reach your fitness goals and get that body that you always wanted, make that lift that much stronger, to excel in your sport. Now is the time to start your best workout routine.